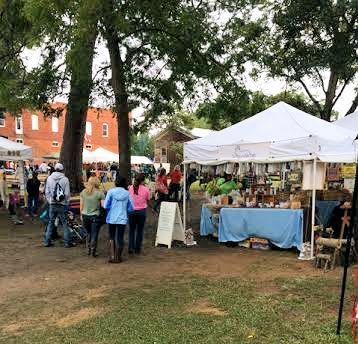 A wonderful festival that happens twice a year near me is the Cotton Pickin’ Fair in Gay, GA. We have attended this festival MANY times in the 24 years that I have lived in Peachtree City. The first weekend in May and the first weekend in October is when this event takes place. 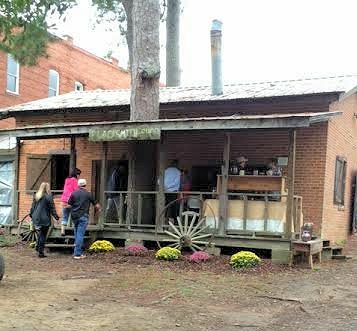 It is held on an old 1910 farmstead in Gay, GA. 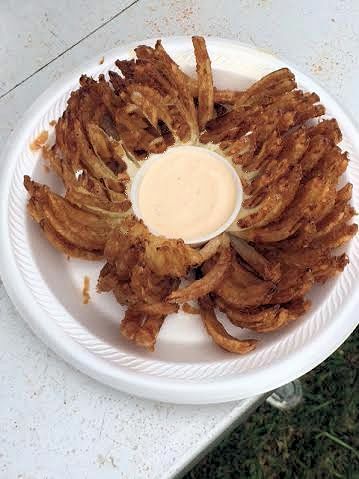 The crowds were sparse because the rain from the week graciously provided by Hurricane Joaquin, but that just meant short lines for the blooming onions. Score! 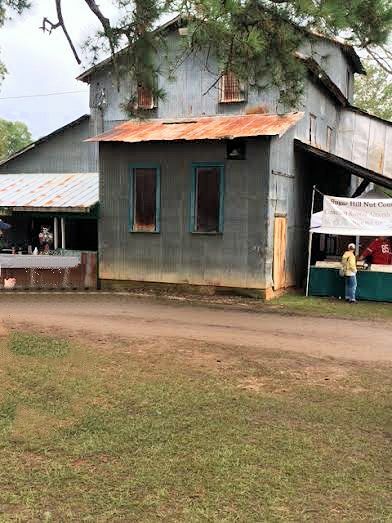 The buildings from the farmstead house different vendors in addition to the traditional tents that vendors bring in. The photo below shows a real working blacksmith. There are demonstrations throughout the day. Note the tree growing through the front porch. 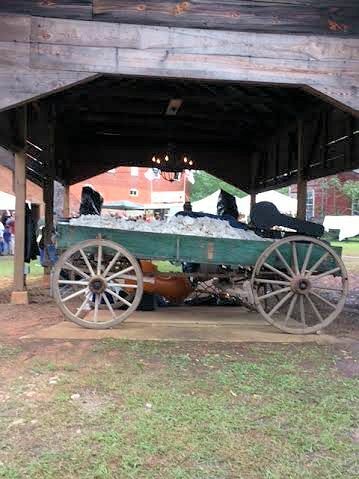 I like this festival because you can buy arts, crafts and antiques. The fair is juried so there aren’t a lot of repeats in what is being sold. I picked up a few Christmas presents — for myself. Ha! 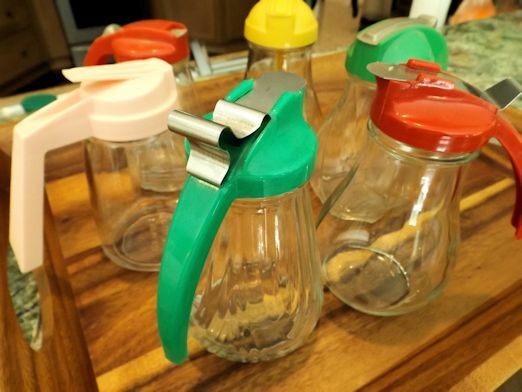 My first purchase was another vintage syrup dispenser. I bought the green one closest to the camera. I now have six dispensers. Do I need more? Probably. 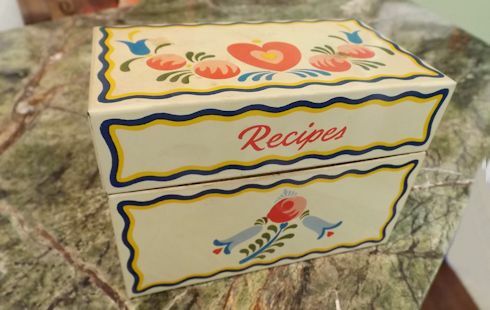 I also bought another vintage tin recipe card holder. I thought I had one like it, but when I got home it didn’t exactly match any of the others so I was glad I didn’t duplicate. I’m going to keep this one as a way to keep up with my menus. I never remember what I serve from one year to the next for Thanksgiving, or Mother’s Day, etc, or who attended and what dishes I used. This way I will efficiently pull out my card and have it at my fingertips. My grandma used to keep up with her menus – somewhat haphazardly, but I run across a listing now and then from her old recipe box. My mom started keeping up with hers when I mentioned a few years ago that I wanted to do it but then I never got around to it. So NOW I’m officially in the game. Maybe I was just waiting for the right box!